As a teacher, the summer affords me extra opportunity to really take a look at how things are going in my house. In doing so, I have noticed some things that, while hopefully not too off-putting to them, set us apart from normal folk. There are as many ways to be a weirdo as there are to be Catholic. This list is not exhaustive, but here we go. 1. 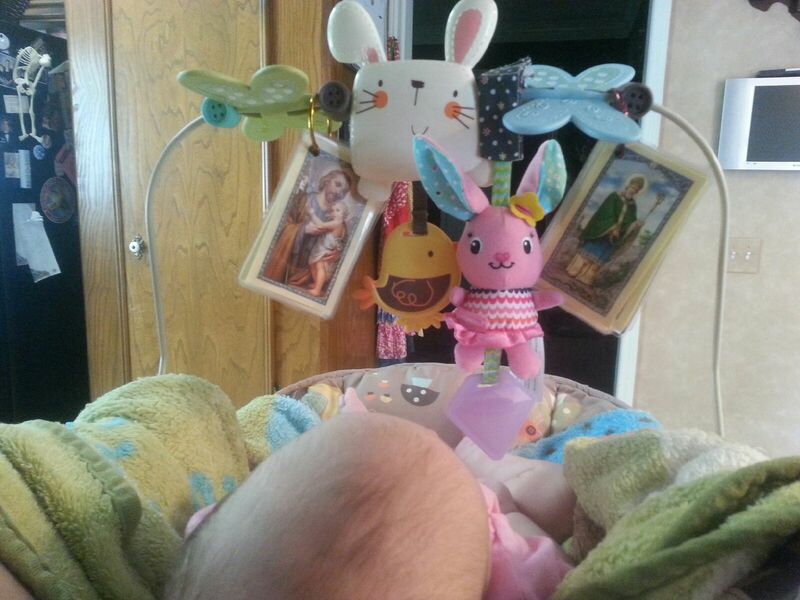 Your babies stare at holy cards. Your bouncers, carseats, or strollers are …modified. *insert Mater screaming,”modified!”* Saint Jospeph and Saint Patrick, pray for us. 2. 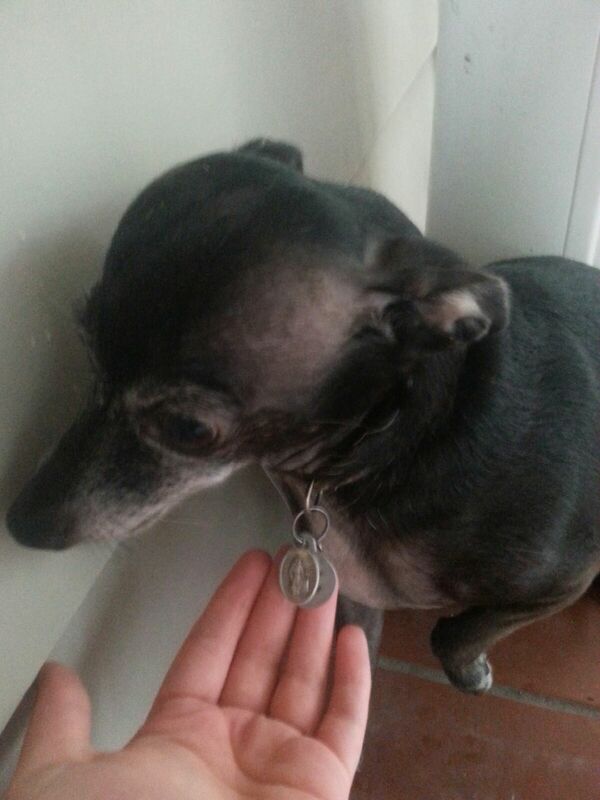 Your dog wears a St. Francis Medal. Your pet has also likely been carted along to a blessing of the pets in the church parking lot on St. Francis’s feast day. Cute children show up with bugs in jars and hermit crabs. Somehow many species congregate and not a one gets eaten. Does it work? Well my dog is getting very old and has always been super annoying, but she has not died nor have we gotten rid of her, so maybe. 3. You have made Facebook posts in Latin. Sometimes you just can’t help yourself and you mark special holidays with special well-wishing in Latin. Admittedly, it has been a while since I have. You might also make posts about obscure saints’ feast days and get way too excited when you see someone else’s posts to that end. 4. 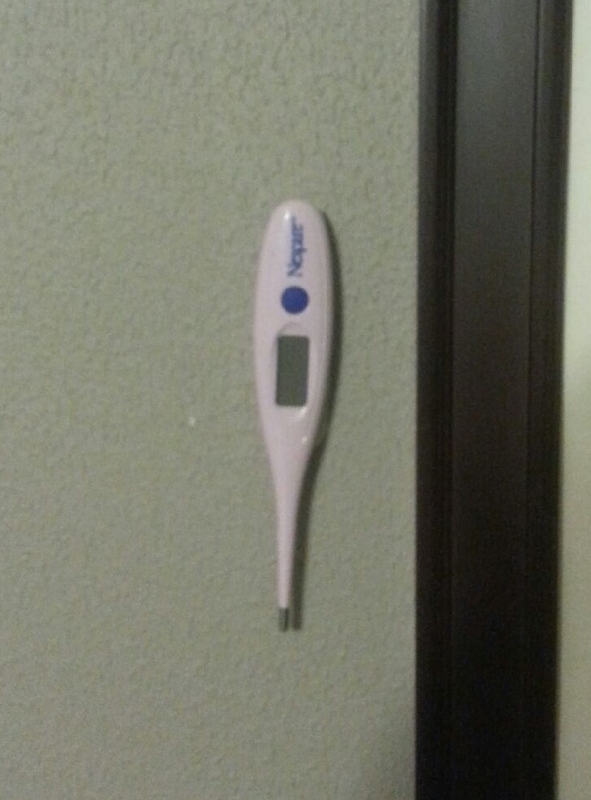 You have a basal thermometer velcro-ed to the wall. You can’t leave it on your nightstand anymore. That is a place for books you want someone to lose your place in and any other items you want to donate to the daily Easter egg hunt for your important stuff. You chart like you’re a Keynesian economist. You know the meaning of pre-rise base line, even if you are no good at figuring out when that is. You have a binder where you keep that mess, but you may as well put Dr. Ian Malcolm on the cover. 5. You panic that your minivan could be too small. See #4. A third child is often the impetus for the purchase of a minivan, but you have reproduced at such a rate that you get sweaty at the dealership and wonder if you shouldn’t just skip ahead to the 16-seater for sale in the parking lot of an abandoned strip mall. You may as well rename your massive health insurance deductible, your yearly donation to the labor and delivery wing of the hospital. 6. You become anxious about Thursday night’s leftovers. You probably behave yourself during lenten Fridays, but Fridays in ordinary time are a dilemma. Do meaty leftovers count as a Friday sacrifice? What if they weren’t even very good the first time? 7. 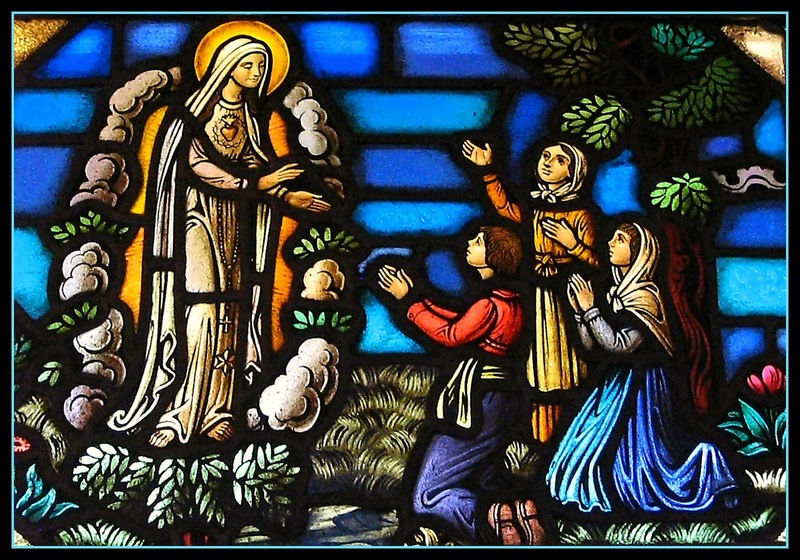 Your personal reaction to Obergefel v. Hodges has less to do with Federal Law and more to do with Our Lady of Fatima. Many who are freaking out right now in the United States seem weirdly focused on this event. Not you. You’ve been freaking out for ages (ok for the duration of the modern age) about the widespread acceptance of: cohabitation, divorce, contraception, abortion…the list of things that hurt society and souls goes on and on. You have been part of a counterculture since forever (oops to hipster-ism). To launch into an apocalyptic spazzfest over the US Supreme Court ruling is to place a massive amount of importance on one country. You know, I have heard there are countries outside of the United States. However, if your alarm level is high, tip your hat to Our Lady of Fatima and put on your brown scapular. You can’t say she didn’t warn you. This entry was posted in On the Home Front and tagged Catholic Home, Catholic Weirdo, Things Catholics Do. Bookmark the permalink.